Le Solution 3.4 constitue l'ultime machine pour l'utilisateur désireux d'obtenir toute la puissance possible d'un chauffage d'appoint. Son immense chambre à combustion de 3.7 pieds cubes accepte des bûches d'une longueur de 22 pouces et procure un temps de combustion étonnant. De plus, cet appareil possède un coupe-feu moulé en C-Cast, un matériel réfractaire léger et révolutionnaire qui garantit à votre unité une durabilité exceptionnelle. Les émissions de particules moyennes produites par le Solution 3.4 sont inférieures à 3.8 g/h, ce qui en fait un appareil d'une rare propreté. Il est difficile d'énumérer en quelques lignes tous les attributs de ce produit unique, tel son ventilateur de série et son dessus en acier d'une épaisseur de 3/8 de pouce. Consultez sa fiche technique et faites place au rêve! 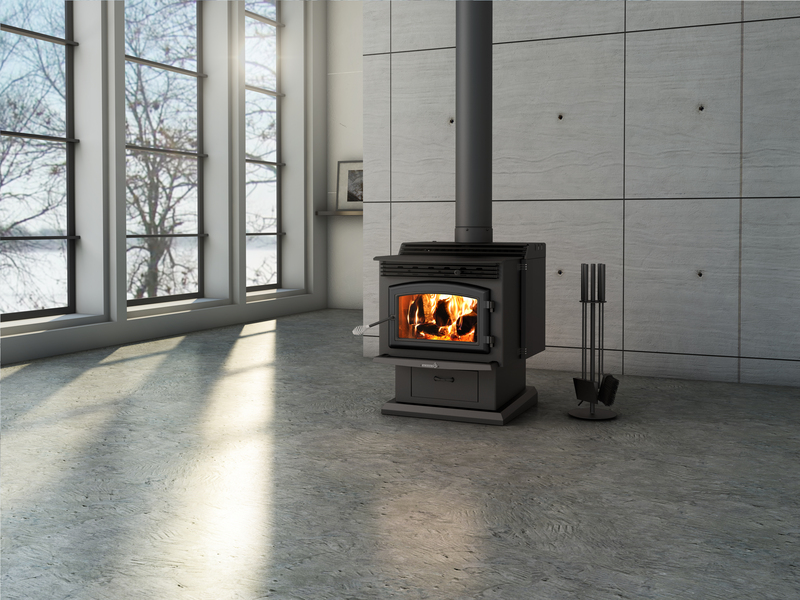 Épaisseur de l'acier – dessus 3/8"
I purchased my Enerzone Solution 3.4 from Classic Stoves and Fireplaces in Fredericton, NB. I was replacing a not so old stove that just wasn't getting the job done, so as a result I was looking for a bigger stove that I could put more wood into and get a longer burn time. Well you can fit a lot of wood into this stove. I have been heating my house with this new stove for the second half of this winter and there is a noticeable difference in the ability of this stove to pump out raw heat which finds it's way to the main floor level of my house as this stove is installed in my basement. For most of the winter we had to keep one electric heater in the living room turned on to 20 degrees as well as my old stove going to make for a comfortable temperature. Since I've had this Enerzone Solution 3.4 installed the electric heat has been turned off and hasn't been on since. I like the fact that the heat shield only covers the back half of the sides of the stove and this makes for lots of radiant heat off the sides, top and of course through the front. Other folks had complained about the blower being noisy and sure it could be quieter but it's a lot less noisy than my old one. I really like the thermal switch that turns it on and off when the stove reaches proper temperature. The other complaint that I have read is about the draft lever/handle being a bit sticky when you move it from high to low and back and it is, however that is a minor thing. I wouldn't let either of these two small issues cloud your judgement, I'm very happy with this stove so far and would highly recommend it. I thought that I would burn more wood as you can put so much more wood into this stove, however I'm finding that the opposite is true with the complete burning of 99% of all fuel into white ash I think that I'm getting more heat out of each stick. In my opinion the Solution 3.4 deserves a 5 star rating. The heat output is very good in comparison to other stoves we have had. Wood fuel consumption was very surprising how long it burns with just plain popular. The damper control is very easy and accessible to work, since it is at the top and not the bottom of the stove, and also sliding from left to right makes for ease of control. We had our Solution 3.4 wood stove installed about 4 days ago. My spouse and I were wondering why we didn't do this sooner. Our stove is performing beyond our expectations and is easily warming up our 2500 sq. ft. home! We live in a cold climate and were at the mercy of high propane prices. We highly recommend this stove not only for it's good looks but for the heating capacity which is distributed nicely with the blower. When we started our search for a stove for our basement we were looking for a few things. A large stove that was well made, had a good warranty reputation, could hold large quantities of wood, and throw off large amounts of heat. The Solution 3.4 hits all these marks. This stove is a beast and has thicker steal and better components than competing brands that I shopped. I shopped many competitor stoves in the same class where a blower was a pricey add on ($325+). The 3.4 comes with the blower feature installed for the advertised price. This is a straightforward stove with no fancy cosmetics or gimmicky features, I appreciate this fact. This being said, nothing is perfect and I have a few comments on how the stove could be improved. First, the blower is noisy in my opinion and seems to get louder as the stove gets hotter. This really isn't a big deal to me because the stove is in the basement and I don't hear it upstairs. Second, for what appears to be such a well built stove, the damper control seems cheaply and poorly designed and is difficult to dial in. It's a thin piece of metal on a handle held on by threaded rod and nuts that slides over multiple holes. The components do not slide well and often stick. These negative aren't anything I can't live with. Overall I'm very happy with the stove and would recommend it to anyone. I look forward to getting many warm years out of my 3.4. We purchased an Enerzone Solution 3.4 and we are very pleased with the stove and our dog just loves it!! Our purebred Siberian Husky(Sadie) loves her new wood stove. When the stove starts goes out, she will wake up either my wife or myself during the night (doesn't care what time it is) so we can restart the stove for her. I have bought a enerzone 3.4 solution and love this stove.I would give it a 10 out of 10. J aime bien ce poele, belle grosseur ,beau model et bonne capacité de chaffage! So far I am enjoying my woodburner! Overall, we're very happy with the price to performance of this unit. We love the efficiency of the stove and the neat visual effects of the smoke burning. The unit is big enough to warm the entire 2200 sf 1.5 story house (open loft), except the 1st floor back bedroom is a little cooler than the rest of the house (difficult to get air to flow there). On the down side, I don't like the blower fan because it is too noisy, tending to vibrate louder at time (when hot?). We also hear a loud expansion noise (CRACK) everytime it heats up - I guess that's to be expected. I am so happy and pleased with my wood burning stove. It heats up my whole upstairs which is about 67 feet long. It is easy to manage and starts right up. I am so glad that we chose this particular brand because it is doing the job well which is more than I expected. This is the 2nd Woodstove I have bought from Higgins Energy. The first being approx. 1997. They are a great company to work with. Very friendly staff. Nous sommes satisfait de notre achat. I have burnt wood as a main source of heating for the last 20 years or more and I have always been happy with the quality of stoves that I could buy back in England. But I was very dissapointed with the first stove that I bought here, a well known USA brand (made mainly in China Idiscovered after I bought it) paint came off in the first week, firebricks needed replacing after two winters $200. I also found a major problem in the cast iron. So I was pleased to finally find the 3.4. The 3.4 has the quality level expected from a real North American product. Found the salespeople very knowledgeable and helpfull.